This pocket-sized guide to identifying and interpreting metal and ceramic marks has been improved with the addition of the most recent hallmarks, along with details of the new hallmarking system. Do you attend car boot sales or browse in antique shops in search of bargains? Have you ever wished you knew more about grandma's silver spoon? Do you envy the experts' ability to identify and date old hand-me-downs? If the answer to any of these questions is yes, Collins Gem Antique Marks is for you. Packed with thousands of clear illustrations, the book shows hallmarks on silver, gold and platinum, as well as those on Old Sheffield Plate, pewter, pottery and porcelain. 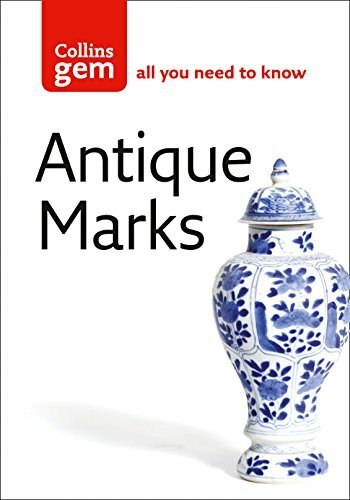 Complete with a history of hallmarks and how to read them, Collins Gem Antique Marks is absolutely indispensable. The book provides: Full hallmarks for silver from London, Edinburgh, York, Norwich, Exeter, Dublin, Newcastle, Chester, Glasgow, Birmingham and Sheffield, along with maker's marks from these cities. Up-to-date hallmarks for gold and platinum. Old Sheffield plate marks, showing the variety of maker's marks. Pewter marks and a selection of pewter touch marks. Pottery and porcelain marks showing both letter and name marks, and symbol marks. Redesigned in new Gem style.